Namikawa Yasuyuki, or how my brain is proved unique. Again. The vase is a typical shippo: copper covered in cloisonne enamels, with silver mounts. It is signed Namikawa of Kyoto. The Namikawa Cloisonne Museum of Kyoto is housed in the former residence of Yasuyuki Namikawa, a famous Cloisonne artisan during the Meiji and Taisho periods. The museum has preserved the main architecture including the artist’s studio and kiln (both of which have been recognized as national cultural treasures), and a garden designed by Jihei Ogawa. Alas, the museum posts no images on its website. 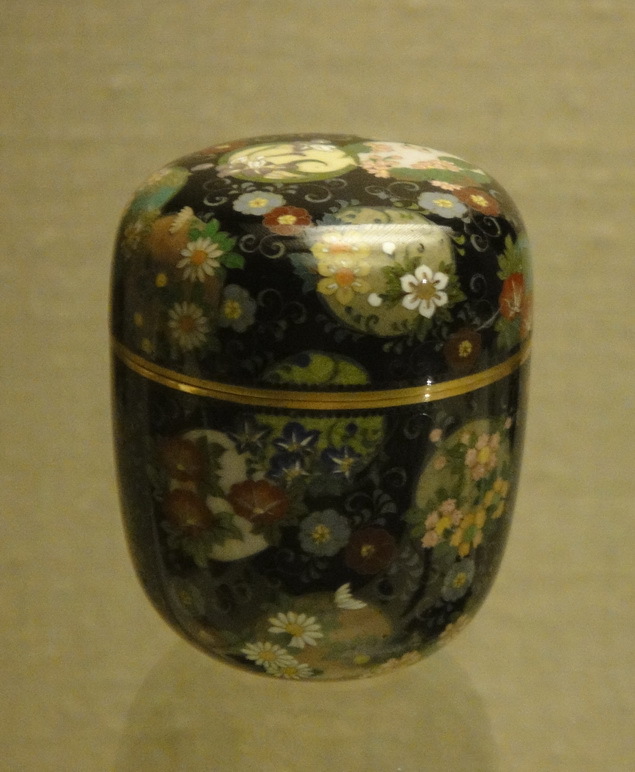 Luckily, V&A has several good photos of a some of the many Namikawas it holds: here. None of my love, though: it isn’t even listed — on the display shelf it stands between the two unpictured vases listed at the bottom of that page. Which is typical: the museum pieces I like best are never reproduced. (And some are banished to stores). I guess I have a mutated brain. 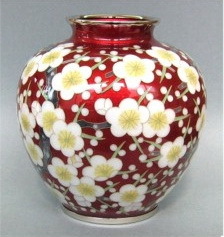 Ando Shippo (Ando Cloisonne) are still around, too, some 150 years old today, with a production facility in Nagoya and shops in both Nagoya and Tokyo. The business is down-at-heel; to make some revenue — any revenue — they’ve gone into the sort of garbage the modern state allows the middle class to afford — key-chains and pen holders; which is where their turn-over is made; but they still turn out nice pieces well. And if you ask, they will make one to order. As you browse, asking learned questions, the Tokyo shop staff thank you repeatedly — bowing so deeply you worry about their crossbones — for coming: “we need customers like you!” They certainly do. Not only has Japan, through years of deflation, grown shabby and fraying at the edges — (once glizzy Tokyo — it was never pretty — has taken on a distinctly Dhakaesque air); but the middle class have been turned into aesthetic idiots — which is what they are everywhere — mistaking, in their clouds of unknowing, image and technology for value. Image is of course total garbage (who cares about Bulgari’s image if what they make is utter cheap junk in machine-bent platinum, for Chrissake); and technology — well, ask yourselves: what value will there be in today’s flat screen TVs come year… 2015? Now, here is a page with links to Ando’s current catalogs. There is much dross: look at the links to the expensive items, near the bottom of the page. Why Ando — and all of Japan, in general — with all its resources and technological prowess should be so stingy with the size of their images, I do not know. I wonder if anyone has explained to them that this is hurting their business. Anyway: look at the JPEG version of the catalog, the PDF is fuzzy. As is often the case, art objects made today represent good value compared to similar quality objects of some age, as if time itself made the least of a difference. The matter is this: they still make them now; will they still in 2025? Buy now if you can. Wasting assets appreciate in value, you know. And consider this: at 91 cm, any modern copies of the two vases would not be cheap — I am guessing $20-30K for the pair, but they would still be 17 times cheaper than the price paid by whoever bought these at the Christie’s auction 2008.